I know a lot of people like simple recipes. I’m weird… when I look at a recipe with just a few ingredients I usually assume it’s not going to be very good. 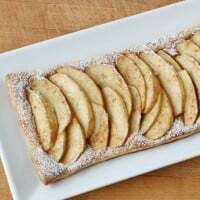 I’ve seen simple apple or pear tart recipes for years… they look pretty, but I’ve always thought “it’s just crust and fruit… how good could it be?” Well my friends, they answer is REALLY good! 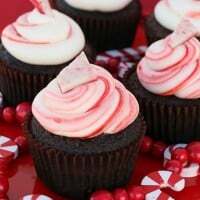 In fact, I feel like I’ve been missing out by not trying this kind of recipe before! 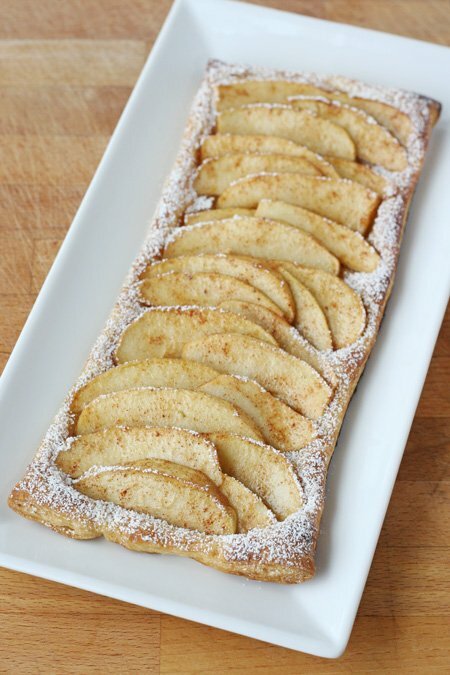 This apple tart is so easy to make, smells amazing while it bakes, and tastes delicious too! The recipe starts with Pepperidge Farm’s Puff Pastry. This is a great item to keep on hand, because you can just store it in the freezer, and then make this delicious recipe whenever you want! Be sure to plan time to defrost the puff pastry according to the package directions (about 45 minutes at room temperature), but once the dough is thawed, this recipe comes together in no time! 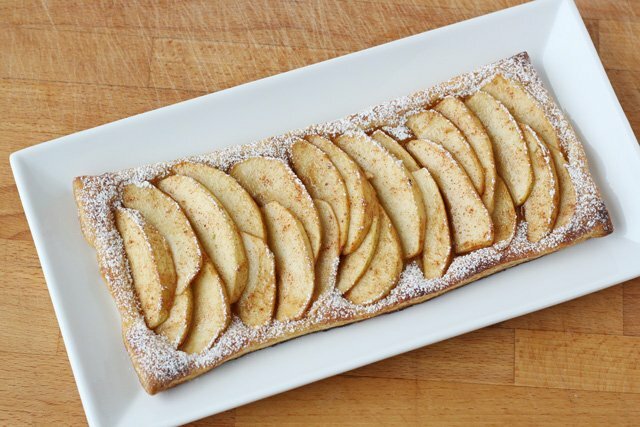 Only a few simple ingredients are needed to create this delicious apple tart. Thaw puff pastry at room temperature about 45 minutes (according to package directions). On a lighly floured work surface, unfold one sheet of pastry. 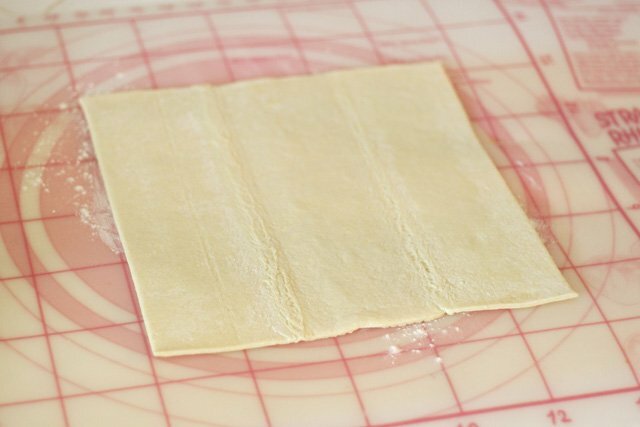 Cut the pastry in half, creating two rectangles. Place the dough on a baking sheet lined with parchment paper, or a baking sheet sprayed lightly with cooking spray. In a small bowl, combine brown sugar, cinnamon, nutmeg, salt and corn starch. Prepare apples by peeling and removing the core,then slice thinly. Put apple slices to a large bowl, and squeeze the juice from 1/2 of a lemon onto apples. Stir to coat. 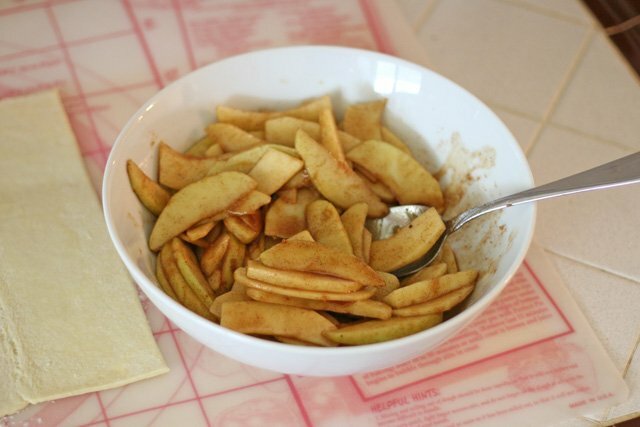 Then, add the contents of small cinnamon/sugar bowl to the apples. Stir to coat. 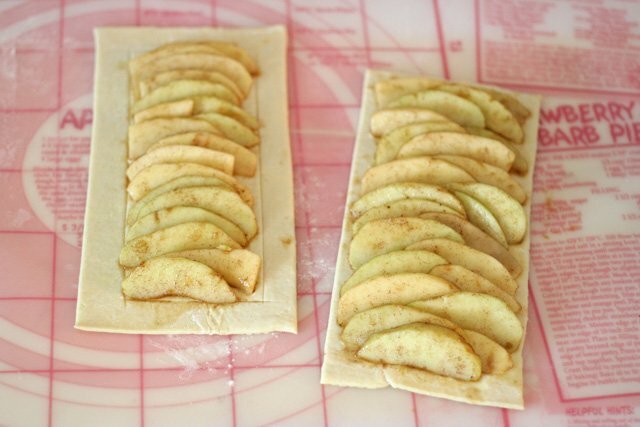 Arrange apple slices on puff pastry dough (like shingles), leaving about 1/4 inch of dough exposed on all sides. Bake in preheated oven for 20 minutes. Cool slighly, and move to a serving plate. Sprinkle with sifted powdered sugar, as desired. Enjoy warm, or at room temperature. Serve with fresh whipped cream, or vanilla ice cream. Notes- Puff pastry is sold in the freezer section, near pie crusts. Plan your time to properly thaw the puff pastry before use (about 45 minutes). I used one granny smith apple, and one fugi apple for this recipe, and it was a nice combo. I’ve included images below to show some of the step-by-step directions, but read the entire recipe above for the full instructions. Once thawed, unfold the puff pastry onto a lightly floured surface. 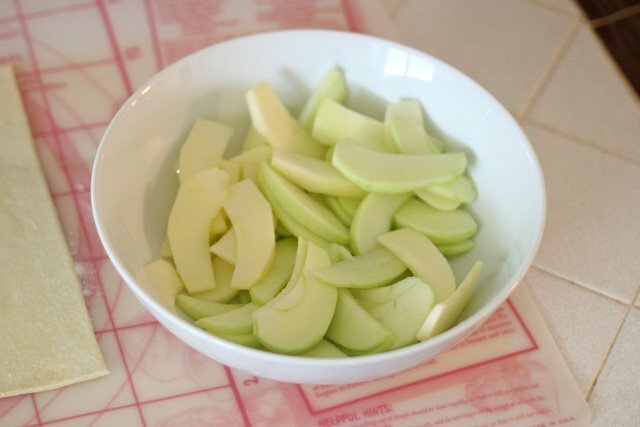 Peel, core and thinly slice apples and put in a large bowl. Squeeze lemon juice on apples, and toss to coat. Add cinnamon sugar mixture (according to recipe above), and stir to coat. 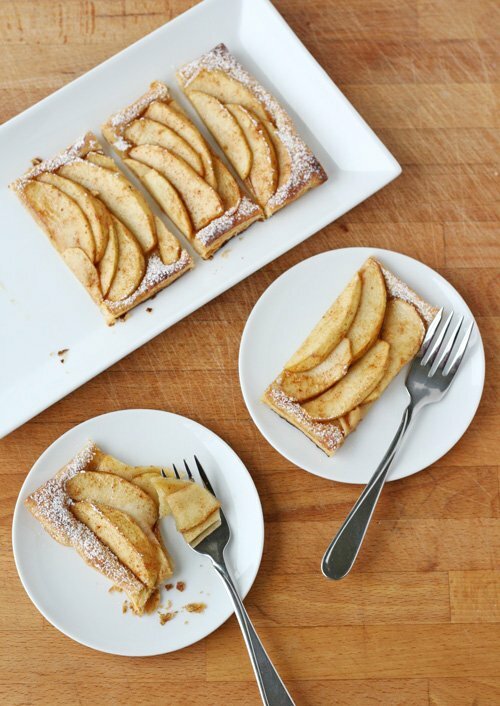 Arrange apple slices on pastry dough. I experimented with two different ways to arrange the apples. On the left, I slightly scored the pastry about 1/2 inch from the edges, so the pastry would bake up and create a defined edge around the apples. Then, I layered the apples in a single layer. On the right, I staggered the apples to more fully fill the pastry, leaving just about 1/4 inch of exposed pastry edge. You’ll notice in the photo below, both tarts baked up beautifully, and either way works great. In the future, I think I’ll go with the style that holds more apples, and has a smaller crust around the edge. Note, the pastries are on opposite sides of the photo, between the image above and below. Another note- In the image above, the apples are arranged on the dough before being placed on the baking sheet… don’t do it this way! 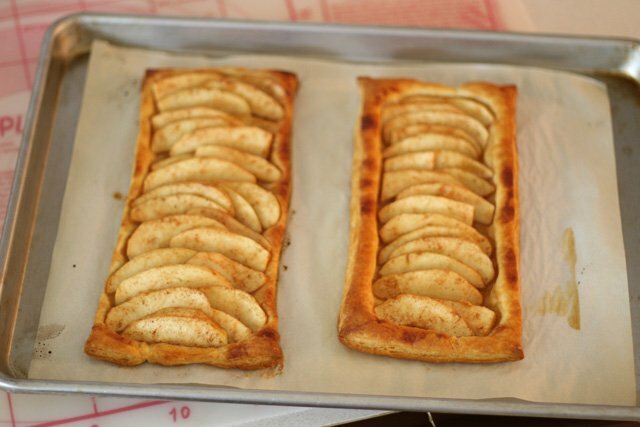 Put your dough on the baking sheet, then add the apples. Once baked, cool slightly, then sprinkle generously with powdered sugar. Move to a serving platter, and enjoy. Eat the tart while still warm, or at room temperature. Enjoy this simple tart as is, or top with fresh whipped cream or vanilla ice cream. Be sure to visit the Puffection TM tab on the Pepperidge Farm Puff Pastry Facebook page and share your own holiday Puff Pastry recipes, and www.puffpastry.com for more recipes, tips and how-to videos. Disclosure- Pepperidge Farm has provided me with supplies and/or compensation for time invested in the Pepperidge Farm® Puffection TM Holiday Entertaining challenge. All text, photos and opinions are my own. I actually eat puff pastry raw sometimes. Wow. That looks so crazy easy and more importantly, so crazy good. I may have to try that out for when my in-laws come over to open presents & have tea/coffee and cookies on Christmas. 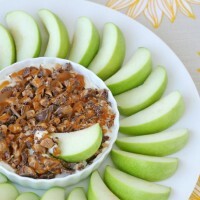 Yummy, I would like to try this with pears. Beautiful! Love how simple it is! 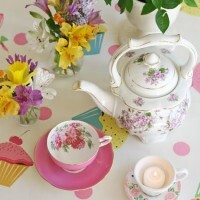 Parfois, les choses les plus simples sont les meilleures!! Très jolie cette tarte! Je ne savais pas qu’on pouvait congeler la pâte feuilletée, c’est bon à savoir! Excellent, quick and easy to make. These days we are in a hurry because the holidays, so this is just perfect. I was just using puff pastry today! And that’s pretty rare…I wasn’t overly impressed with what I used this time, and homemade is quite the excursion…I’ll have to have this brand next to see if it has better flavor than the stuff I had. I’ve been wanting to do a simple tart for a while. I’m kind of like you though and like the ‘challenge’ of a long ingredient list! This was pretty tasty and really convenient that it could me made with ingredients that I already had on hand. I used gala apples which tasted very good, but used 2 1/2 because they were a little smaller. Also, I will cut the sugar next time to 1/3 or 1/2 cup brown sugar because it was just too sweet with the full 2/3 cup and made a mess when cooking. 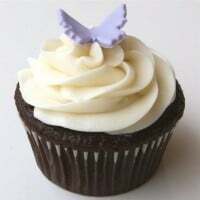 Definitely serve with powdered sugar sprinkled on top because of the aesthetic effect.